People have different preferences. Because of this, you can have some fun and personalize your MacBook desktop. Most folks put all their documents, pictures, and videos on their Mountain Lion desktop because the file icons are easy to locate! Your computing stuff is right in front of you, or is it? When you keep your stuff crammed on your desktop, you end up having to scan your screen for one particular file, an alias, or a particular type of icon, which ends up taking you more time to locate on your desktop than in your Documents folder! And don’t forget, open windows hang out on your desktop too — to find anything, you have to close or move those windows! Plus, you’ll likely find yourself looking at old icons that no longer mean anything to you or stuff that’s covered in cobwebs that you haven’t used in years. Arrange your desktop so that you see only a few icons for the files or documents that you use the most. Leave the rest of the desktop for that cool image of your favorite actor or actress. Keep desktop icons arranged as you like. From the Finder menu, choose View→Show View Options. Select the Sort By check box. 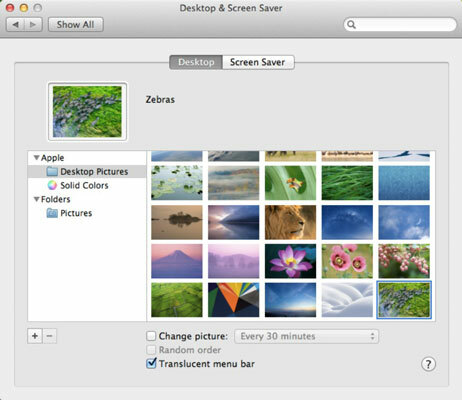 From the pop-up menu, choose the criteria that Mountain Lion uses to automatically arrange your desktop icons, including the item name, the last modification date, or the size of the items. Many users like things organized by name, but other MacBook owners prefer to see things organized by date (putting the most recently modified at the top, for example). Right-click any open spot on your desktop. From the right-click menu that appears, choose Change Desktop Background. The Desktop & Screen Saver pane appears. Browse through the various folders of background images that Apple provides or use an image from your iPhoto library. Display all the peripherals and network connections on your system. Make sure that all four of the top check boxes (Hard Disks; External Disks; CDs, DVDs, and iPods; and Connected Servers) are selected. If you’re connected to an external network or you’ve loaded an external hard drive or device, these external storage locations show up on your desktop. You can double-click that Desktop icon to view your external stuff.